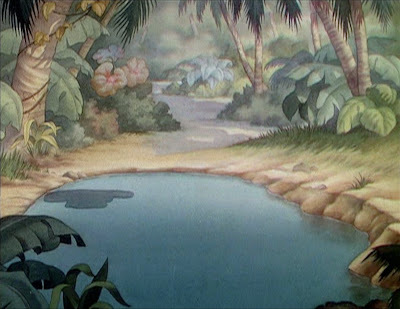 Here's another re-created pan background from HAWAIIAN HOLIDAY. Pluto chases a crab across this polynesian landscape. I've included left and right sections as well as the full pan so you can see all the details. There's a lot of activity over this lush tropical background. I could have airbrushed over the shadow in the pool, but decided to leave it intact. Note the lovely composition, and the tropical plants behind the pond. 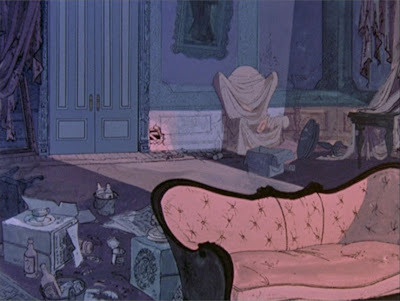 What THE ARISTOCATS lacked in story and character appeal was balanced in some measure by beautiful xerographic background designs. Here is a dandy - the butler Edgar's room, filled with sumptuous detail, richly embellished. 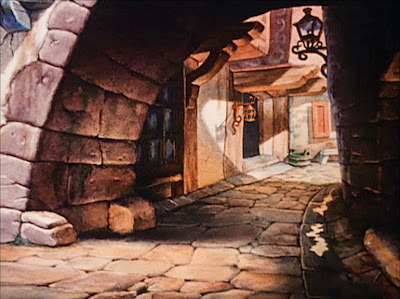 Jeff Pepper, our great friend and Disney blogger extraordinaire (http://2719hyperion.blogspot.com/) has re-created another classic Disney B/G to share with our readers. Jeff wrote: "I was taking a look at Truant Officer Donald... and couldn't resist putting together this composite. Donald ultimately pops up out of the impromptu grave on the right end." Jeff, thanks for sharing this beautifully crafted re-construction with us. Fantastic! Here's another rarity! 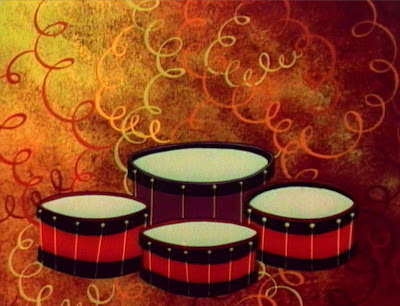 Pluto scampered around these drums in his short featured segment during the opening of THE MICKEY MOUSE CLUB. Love the confetti! 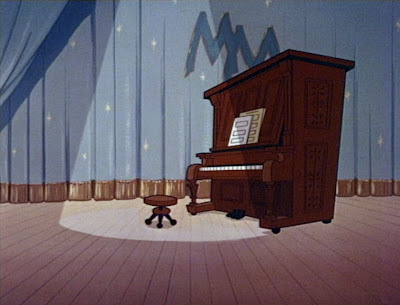 Here's a view you've never seen... the MICKEY MOUSE CLUB stage, no piano, and no Mickey! 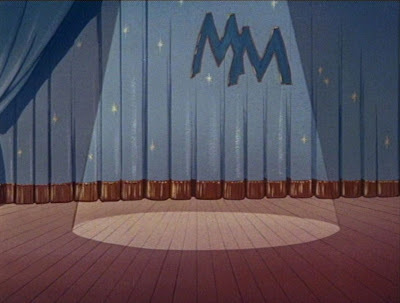 Here is the terrific background from the "Fun With Music Day," (Monday) opening sequence of THE MICKEY MOUSE CLUB. 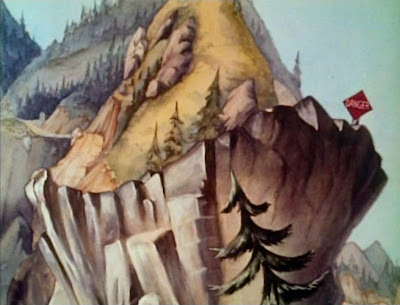 PETER AND THE WOLF was part of the compilation feature MAKE MINE MUSIC. 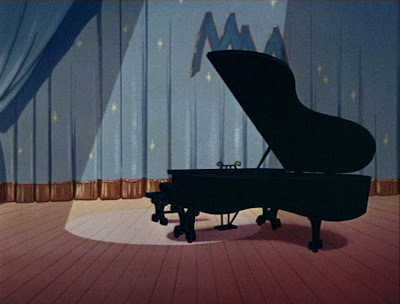 The composer Prokofiev wrote the music with a Disney animated feature in mind! At the end of this hot summer, I thought everyone might enjoy some cool, wintery backgrounds. Here's the re-constructed B/G from THE BRAVE LITTLE TAILOR. 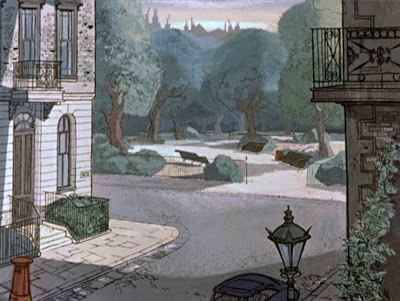 Here are two views of the tree from which Mowgli gets his first, birds-eye view of the pretty girl from the "man village." 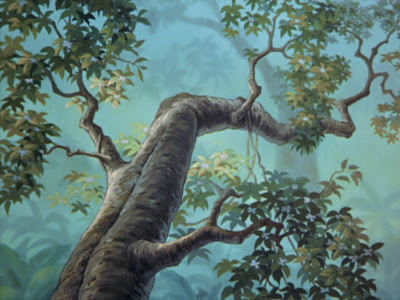 Love the Jungle Book art! Many of the backgrounds in HOW TO RIDE A HORSE were minimalistic. 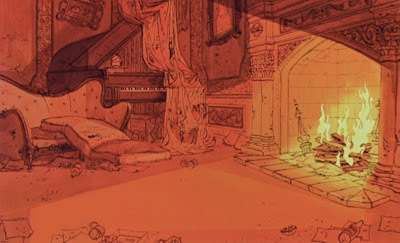 This was one of the few "full-blown" Disney B/Gs. 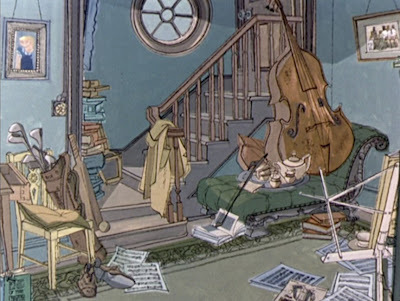 Readers are familiar with my enthusiasm for the groundbreaking style in 101 DALMATIANS. The advent of the xerox drawing-to-cel process (which replaced hand inking) was exploited to great advantage, creating a fresh, modern look. 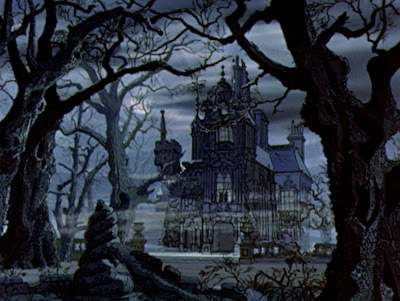 Shown first is the wonderfully moody rendering of the DeVil mansion exterior. 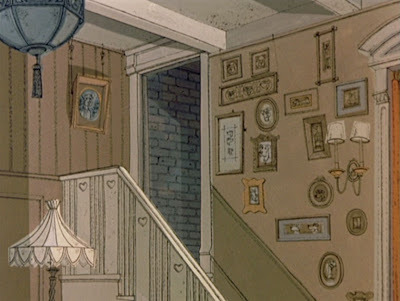 Next, the upstairs hallway. Love the stylish pen-and-ink design with color wash, typical of this film. 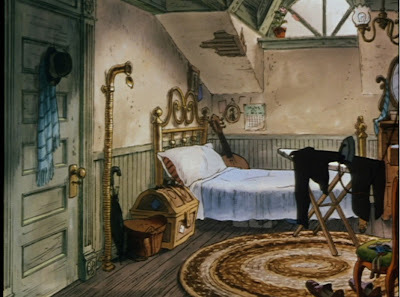 Perhaps my favorite background in the whole film is the blue bedroom. This re-created pan B/G is fairly bursting with detail and extravagant, imaginative design. 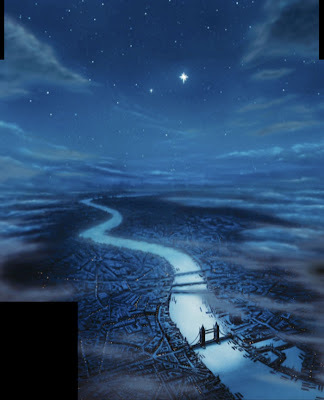 Here are the three opening shots from PETER PAN. 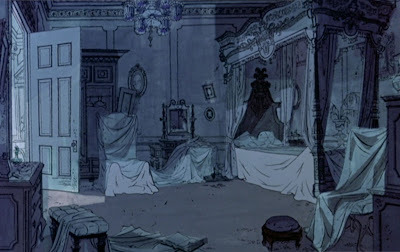 Pan backgrounds one and two, now re-created, are incredibly atmospheric. The clouds in both were animated in the forefront via the multiplane camera. The third piece is an aerial view of the Darling house and neighborhood. 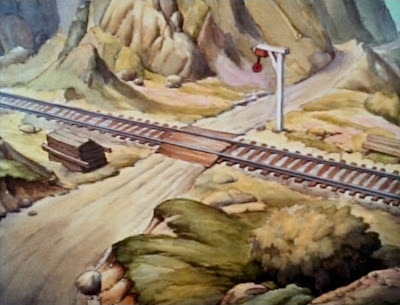 This is the digitally re-created pan background from the opening shot of THE RELUCTANT DRAGON. 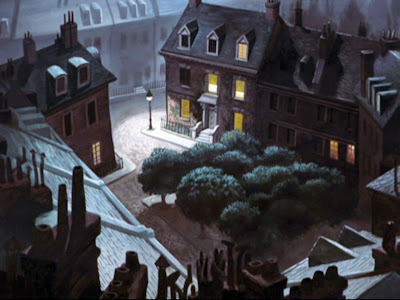 Here are several backgrounds from MICKEY'S TRAILER, including a re-created pan background. Enjoy the trip! Now here's something different: the stage of the Mickey Mouse Club without its star! It's a beautifully conceived B/G. Love the antique upright piano! 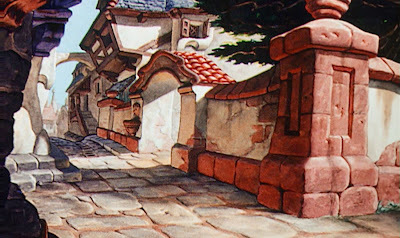 While not the most significant piece of B/G art ever created at the Disney studios, it is decidedly historic and incredibly nostalgic. Hope you enjoy the view! This is a first - a guest background! Friend Jeff Pepper sent this, which he created. 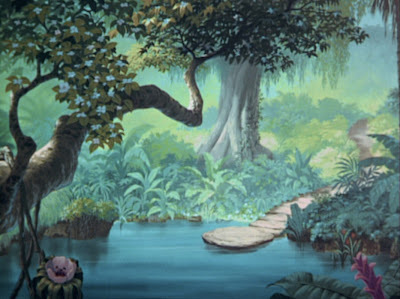 Says Jeff: "I decided to try to do a composite from the Goofy short "Two Weeks Vacation. 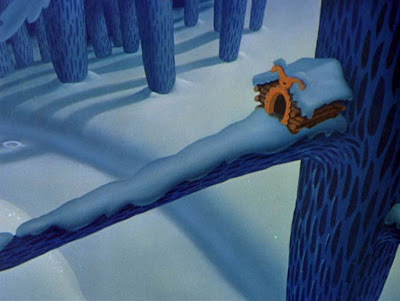 I always got a kick out of the shack he stayed in with the false facade. Thought I'd pass it on if you ever want to use it." Thanks for sharing this, Jeff. Terrific job and a wonderful B/G. 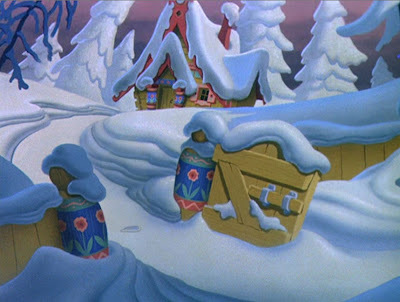 Here is the opening pan shot from HAWAIIAN HOLIDAY. As Mickey, Minnie and Donald's positions are fixed, there was no way to get to the background areas behind them. Nonetheless, the rest of the composited pan says "aloha" in a big way! I am quite fond of "THE SMALL ONE." 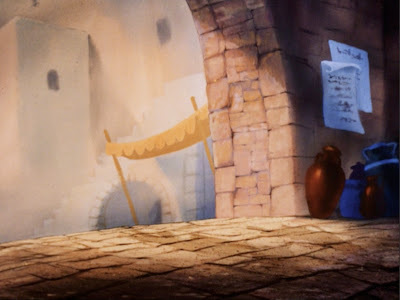 It's a quintessential Disney story with all the key elements: beautiful animation, characters with whom we empathize. a sweet story, well-written music and heart-tugging sentiment. 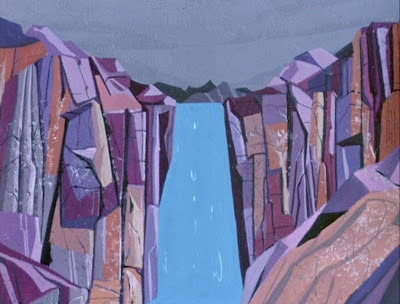 This was created during the "passing of the baton" from the old animators to the "new kids" in the 70s. 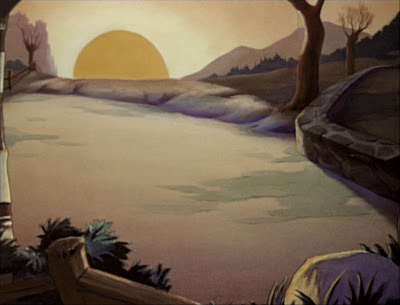 It's a lovely little film, and this background beautifully evokes the "Holy Land" setting of the story. POPPINS penguins danced their way into our hearts in 1964. Like many in showbiz, they are both performers and waiters! Here are two views of the penguin restaurant. "Order what you will, there'll be no bill, it's complimentary!" 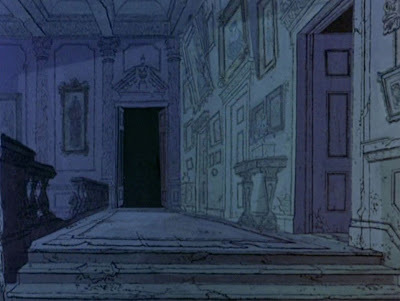 101 DALMATIANS was Disney's first feature to showcase the new Xerox method for transferring animators' drawings to cels. The animators loved it! For the first time they could see their actual drawings on the screen, rather than the "tracings" of the ink and paint department. The technology created a new, very modern look. 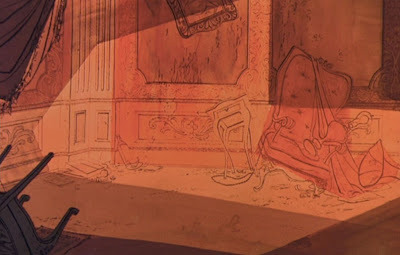 Even the backgrounds took advantage of xerography; elaborate layouts were transferred to cels and placed over watercolor washes. 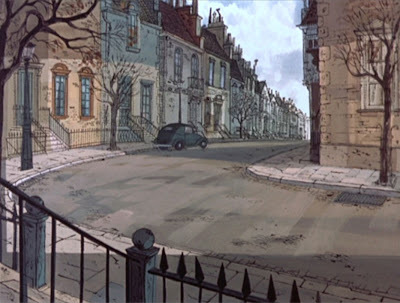 Here are a few terrific, stylish backgrounds, including a wonderful pan B/G of a London street. I promise we'll revisit this film and its art. 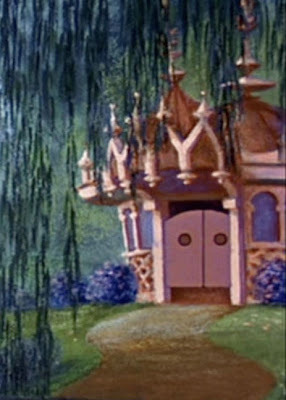 PINOCCHIO was Walt Disney's second animated feature. The beautiful background art speaks eloquently for itself. 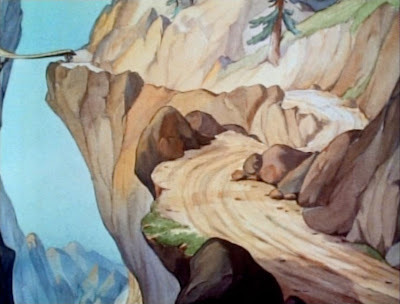 All four backgrounds have never been seen like this, lovingly re-created to showcase the European "old world" look created by Disney artist Gustaf Tenggren. 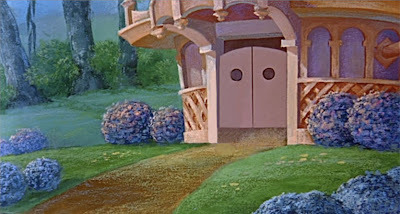 It has been said PINOCCHIO was Walt Disney's best film, artistically and technically. Anyone who loves animation would be hard pressed to disagree. 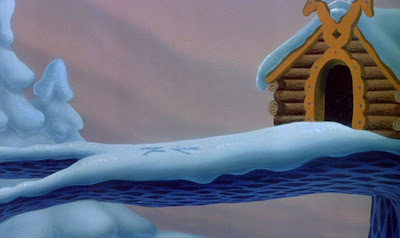 PAUL BUNYAN is a Disney featurette that deserves more recognition. It's an incredible treat for the eyes. 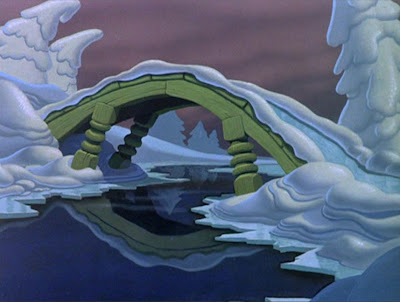 And no wonder... the color stylist was Eyvind Earle, whose work on "Sleeping Beauty" created a whole new look for Disney. PAUL BUNYAN continues the stylized, modern approach, and takes it even further. The forest motif is beautifully rendered, as you can readily see. 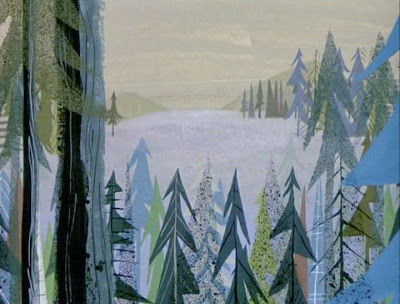 The background credits for PAUL BUNYAN belong to Walt Peregoy.